We can provide a range of maths games and puzzles, aimed at both children and adults. Popular maths puzzles include number sequences, written puzzles that require the formation of mathematical equations and varying sophistication to be solved, and maths square puzzles. One of our most popular maths related puzzles is the so-called Math Square. Each number from 1 - 9 is placed once per puzzle; the aim is to work out where each number goes to solve the equations. You can view this Maths Square Puzzle in PDF format complete with solution. There are two versions of this puzzle available. The first, and more common in publication, requires you to perform the sums from left to right and top to bottom. 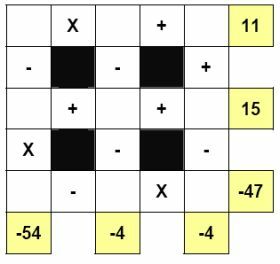 The second less common version requires the calculations to be performed in strict BODMAS order, so for instance you perform multiplications before subtraction or additions... this is the case in the sample puzzle shown here and the sample PDF also. The maths square comes in a range of sizes from 3 x 3 which is perfect for younger audiences, right through to much larger sizes for a seriously difficult adult challenge!